Andrew Mallet, lately of His Majesty’s finest, former exploring officer, and veteran of Waterloo has settled into peaceful retirement in his childhood home in Cambridge. He retains a limp as a reminder of a particular desperate charge in Belgium. The scars on his face, a gift of the French during a lengthy stay as their “guest,” is rarely noticeable thanks to the twinkle in his eye and intelligence is his regard. He and his wife, the former Lady Georgiana Hayden also have a home near Russell Square in London, at which they schedule regular salons of a scholarly nature. Both of the Mallets enjoy their work as classics scholars and translators. He joins me in the front a fire in the parlor of their London home. CW: It is good to be inside on this brisk cold day. The hot tea is a blessing. Thank you for meeting me. CW: Can you tell my readers a bit about your childhood? AM: I grew up in the shadow of the university in Cambridge. My father chose marriage over a faculty appointment and so was never a fellow. He did very well, however, as a tutor and translator. My mother died when I was very young, I hardly knew her. CW: So your father raised you? Was that difficult for a scholar as you describe him? AM: I would suppose so. My own sons are a handful. He had just me. I never lacked for affection and attention, however, no matter what. I learned to respect his study when he was at work, but he always made time for my own education and for games. We didn’t travel abroad, but he took me to the great Cathedrals, the Roman ruins, and the royal sights of England. History was a passion we shared. CW: He sent you to Harrow? AM: I was a scholarship student. The friends I made there changed my life. I began visiting their homes on holidays, and having them to mine. CW: One family was that of the Duke of Sudbury. How did you like staying in their opulent houses? AM: I found the houses as cold as the people it them. 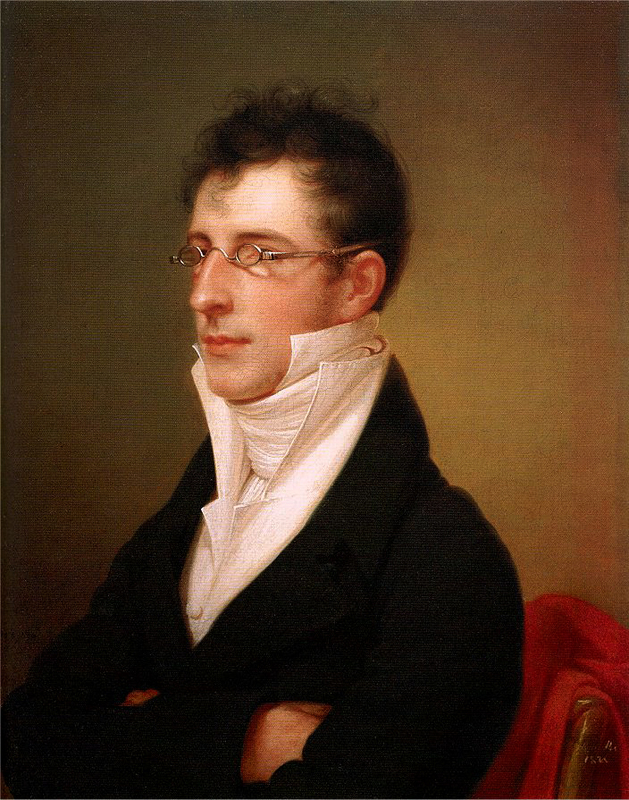 I never envied Richard (Sudbury’s heir, the Marquess of Glenaire) his life. His parents ignored him or pressured him; they never hugged or encouraged. His younger sisters were brats too snooty to even speak to a mere tutor’s son. CW: But I gather you liked his older sister, to put it mildly. AM: I always liked Georgiana. She didn’t speak much, but she didn’t snub me either. The day I found her in her father’s conservatory struggling over a passage from Plato in a schoolboy text and realized she was trying to learn on her own, I fell head over heals in love. Slipping her texts became great fun. CW: Yet you joined the army. Did your father approve of your military career? There is a long pause before he answers. AM: Father expected me to return to the University for advanced studies. As you know, I declared myself to Georgiana foolishly and recklessly. Before I could approach her father, her brother Richard drew me aside and showed me the folly of that. The duke, her father, would have ruined me and made her life a misery. Leaving seemed to me, young as I was, like the best thing. I let Richard buy me colors. CW: Do you regret it? AM: I regret my father’s disapproval. I regret leaving him alone. I regret missing his final days and funeral. Georgiana? Well, that turned out well in the end, didn’t it? A small boy runs into the room shouting for his Papa. Two books slip from under his arm and bounce on the carpet. He stops abruptly at the sight of a stranger. AM: Aeneas! Mind your manners. AM: May I present Master Richard Aeneas Mallet. Small boy: My mama calls me Wee Richard. I prefer Ricardo. Small boy: The Pirate. He climbs into his father’s lap and looks attentively at the interviewer. CW: One other question. Why did you settle on classics for a career? AW: After Waterloo I wanted only peace and a chance to heal. I also wanted work my father would be proud of. Cambridge was a natural fit. Besides, Georgie was struggling with her own work. She wanted access to libraries and learning. What she needed—here his grin turns naughty—was a man. 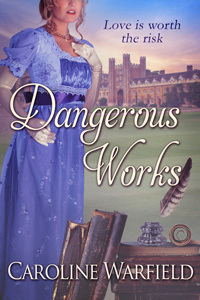 Andrew and Georgiana’s story can be found in Dangerous Works. 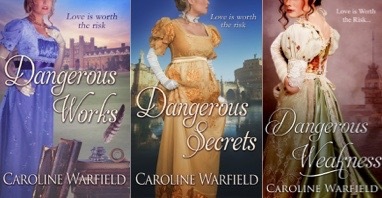 Richard, the Marquess of Glenaire finds his happily ever after in Dangerous Weakness.